Helikites are neither just a kite or just a balloon, they are a unique combination of both. As such, they employ the advantages of both without incurring too much of their disadvantages. 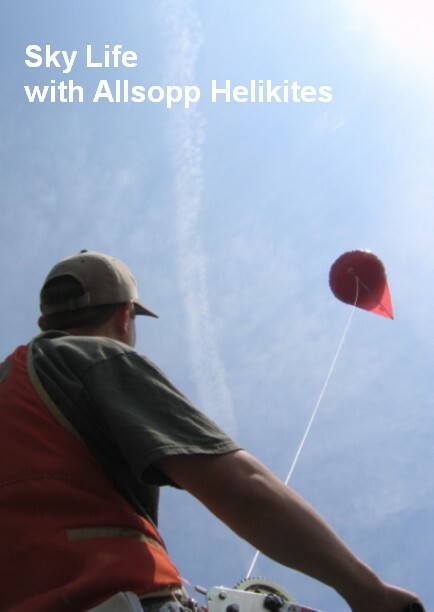 The Allsopp Helikite is lighter-than-air like a balloon but does not get knocked down by the wind like a normal balloon. Winds do the opposite to a Helikite - they forces it powerfully upwards. Normal kites get pushed up by the wind but come down if the wind changes or reduces in strength too much or gets too strong for their adjustment. Helikites can fly to great heights in no wind and then catch any breezes that may exist at altitude. They can then use that breeze to fly many thousands of feet high with ease. The balloon used by Helikites is fat and rounded, this is essential to provide good helium lift (about twice that of a comparably sized blimp). It also ensures that changes in temperature affect the Helikite as little as possible. Most balloons shaped to fly like kites collapse when they hit cold air due to the shrinkage of the gas inside and consequent loss of pressure needed to retain their shape. This is not a problem with Helikites, so they are far more reliable. Nothing else in the world has so many beneficial flying characteristics. So only the Allsopp Helikite can do so many self-balancing unicycle for sale aerial jobs with such ease.